An archpriest (or archpresbyter) is an ecclesiastical title for certain priests with supervisory duties over a number of parishes. 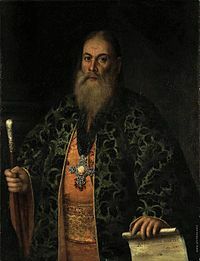 The term is most often used in Eastern Orthodoxy and Eastern Catholic Churches and may be somewhat analogous to a monsignor in the Latin Church, but in the Eastern Churches an archpriest wears an additional vestment and, typically, a pectoral cross, and one becomes an archpriest via a liturgical ceremony. Chisholm, Hugh, ed. (1911). "Archpriest" . Encyclopædia Britannica. 2 (11th ed.). Cambridge University Press. p. 446.